This would be an exciting addition to every portable device ever made. RCA’s Airnergy contains a cellphone class lithium battery, which it claims able to charge itself using Wi-Fi networking signals. Supposedly any Wi-Fi signal will charge the Airnergy’s internal battery eventually, the more signals the better. 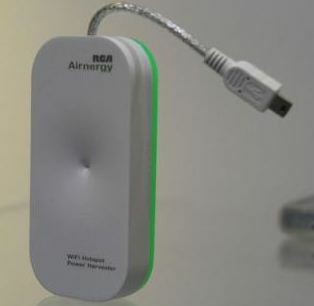 Once charged, the Airnergy can then be used to charge other USB electronics. Their hope is to quickly shrink the size of the components down to the point that they can be built into a battery itself. Users would just have to locate the Airnergy version of the battery for their cellphone / camera / MP3 player. RCA believes the cost will be almost negligible to include in current devices to the extent that those replacement batteries will be on par with simple aftermarket replacement batteries. They plan to sell the Airnergy for $40 to $50 in the near future. Custom batteries will come a few generations after that. I guess we have to just wait and see! HP urges consumers to re-check HP notebook models and HP batteries Breakthrough For Electric Vehicles: LiFePO4 Batteries Why I love Canon! x10 faster WiFi… Intrigued…? Read on! « LG’s World First Full HD 3D Projector.